Narendra Modi is likely to continue India’s strategic partnership with Russia but his laser-like focus on Asia means Moscow will have to adjust to the new realities in New Delhi. In trying to decipher or predict Narendra Modi’s foreign policy, it is pertinent to keep in mind that the Prime Minister-elect will be guided solely by India’s interests. For the first time in independent India’s history, national interest will become the guiding principle at South Block. Until now, India’s foreign policy has been mostly jerry-rigged – dictated by extraneous reasons such as economic weakness, personal prejudices (Jawaharlal Nehru’s dislike of the Americans, which he inherited from the British elites) or extreme naivete (Indira Gandhi freeing 100,000 Pakistani prisoners of war without first settling the boundary issue). Modi’s election heralds an end to childish ad hocism. To Indians who watched with dismay a succession of corrupt leaders demolishing the world’s most promising economy, the Gujarat strongman comes as a savior. He is the Vladimir Putin of India – without the shirt off. Like Putin, who nursed the collapsed Russian economy back to health and revived its demoralised military, Modi is expected to do something similar. Indians expect their new Prime Minister to irrevocably set the country’s compass to its destiny as a superpower – a place it occupied for 1700 of the past 2000 years. Modi is unlikely to depart substantially from India's traditional foreign policy postures, so the decades-old India-Russia strategic partnership is likely to chug along. “India and Russia have never been prisoners of bilateral ties because of a confluence of mutual interest on a myriad of issues,” says columnist Mahendra Ved. At any rate, Indians as a people – cutting across regions – consider Russia a friendly nation, and that won’t change any time soon. India's unmistakable backing of Russia during the Crimean and Syrian crises springs from New Delhi's aim to promote strategic coalitions such as the BRICS as a counterweight to the American globocop. No less than Shyam Saran, Chairman of the National Security Advisory Board, has called for Russia to play an active role in the Indo-Pacific area in the interests of creating a more “balanced security architecture”. A refreshing new aspect of India-Russia relations is that there has been a shift from defence to the economy. This has already started, with massive investments flowing from Moscow to New Delhi and back. Western sanctions – though largely ineffective – have also had the unintended consequence of driving Russia even closer to India. For instance, both countries are in talks to construct the daddy of all pipelines that will transport gas from Russia across the Himalayas via China to India. If this $30 billion conduit – the world’s most expensive – sees the light of day, it will enable Russia to vector its energy export policy towards Asia and away from Europe. At the same time, energy-hungry India – already the world’s third largest oil consumer – will be able to considerably reduce its dependence on the shaky Middle East. India has also invested heavily in Russia’s hydrocarbon sector. “India’s policy-makers are trying to promote energy cooperation based on political understanding,” says international oil economist Dr Mamdouh G. Salameh. One area where things are likely to change is defence procurement. Because Modi's BJP is strongly committed to a militarily strong India, the country’s defence indigenisation programme is likely to get ramped up. With former army chief V.K. Singh now a leading member of the BJP, military matters will be treated with more urgency in New Delhi, quite unlike the regime of the outgoing – and incompetent – defence minister A.K. Antony. Currently, defence trade is at the core of the Russia-India bilateral relationship. In this backdrop, an indigenisation drive with the afterburners on could see Moscow’s leverage in India diminished. If Russia wants to remain the leading player in India’s defence sector, then it has to step up partnerships with private Indian companies –an area in which American and Israeli companies have a head start. Modi will differ from former Indian Prime Ministers, whose compasses were set either towards Moscow or Washington. Both by choice and necessity, Modi’s favourite destination is East Asia. The denial of an American business visa may have something to do with the direction of his travels, but that doesn't explain Japanese Prime Minister Shinzo Abe’s developing friendship with Modi. Even as Japan’s relationship with the United States is fraying after Abe’s visit to the Yasukuni shrine – seen by critics as a symbol of Japan’s past militarism – Tokyo is getting increasingly chummy with New Delhi. Both Modi and Abe have developed a close personal friendship and are known to talk over phone. 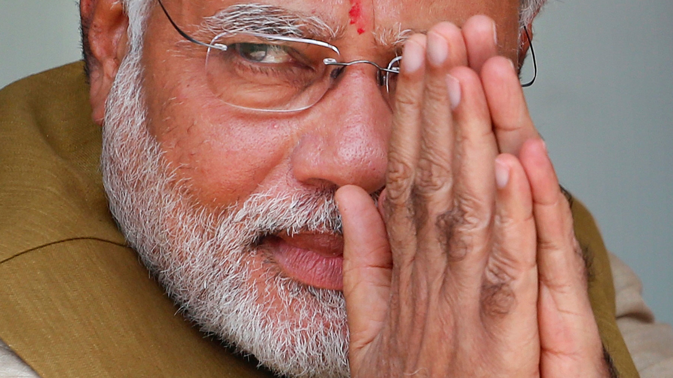 While Modi is not a vindictive politician, there will be payback – good and bad – for everyone. Diplomats from Japan and East Asia, where he got the red carpet, will be the favoured lot whereas those from the West, which treated him like an outcaste, will have to walk sideways in South Block corridors. To be sure, payback isn’t a priority for Modi. For, there is his world view that overrides everything. He is the first Indian leader who – to the delight of the Indian masses – is proud of his Hindu heritage. His close affinity with the nations of East Asia springs from their ancient religious and cultural bonds with India. It would be interesting to see how this world view shapes Modi’s foreign policy in the days ahead. A mostly well-written Brookings Foundation article reports – with a tinge of envy – that Modi will strike a balance between “shakti and shanti”, the Sanskrit terms for power and peace. This, it says, “is a clear appeal to India’s cultural heritage, and specifically to the Hindu heritage that is central to the core ideology of his party. The strength of Indian culture is a point of pride across the political spectrum, but coming from Modi’s BJP, this emphasis delivers a message more domestic than foreign. It could have foreign ramifications, however”. Like all good Gujaratis, Modi’s mantra is business. Under him Gujarat has leapt ahead of India, with the state contributing a sizeable 24 percent of India’s total exports. When it comes to business, the man has no friends or foes. Any nation that comes without ill intentions will be welcome in Modi’s India.